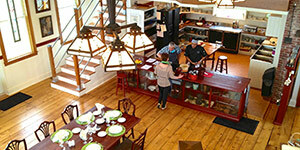 The Table offers one-of-a-kind hands-on culinary experiences featuring Prince Edward Island foods and culture. Our small classes of 8 to 10 people allow you to learn about different Island foods and to see first-hand how they are grown and harvested. Whether we have live demonstrations in the Studio or take a trip to a farm, you will have an unforgettable and fun experience, getting your hands a little dirty, talking to locals and trying something new along the way. In each class, you will join our Chef in the kitchen to create both understated and sophisticated culinary dishes using fresh local ingredients. 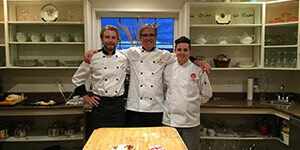 Classes offer something for everyone, from the novice to the expert cook, providing instruction on cooking techniques as well as the products being used. You get to choose how involved you want to be, you can get right into things or stand back and learn. At the end of the class you will sit down to enjoy a lunch of the dishes you have prepared with some freshly made bread and a glass of wine, beer or beverage of your choice. You will be provided with the recipes you made and pictures from the class to impress your family and friends with your new culinary skills and tales of your experiences on the Island. Check out the list of classes below to find the one for you! An old-fashioned Island picnic for the whole family! One of the first social gatherings Anne Shirley delightedly attends after her arrival at Green Gables is a fun-filled Sunday-School picnic. In this class, we celebrate childhood dreams and Anne’s excitement for her first picnic by preparing some savoury recipes and sweet treats from days gone by (with a little help from modern kitchen equipment!) for an outdoor picnic under the beautiful blue skies of Prince Edward Island. 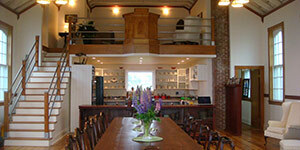 Enjoy the simple pleasures of time spent in the kitchen with family and friends, and the beauty of Anne’s Island home. It’s a perfect day for a picnic! Recommended for children over the age of 6 years. Apples are the gems of the Fall harvest! Almost 30 varieties of heritage and new-generation apples are grown across the Island, preserving apple-variety history and the environment by scrubbing carbon emissions and acting as wind barriers to prevent erosion. Travel with us down one of PEI’s famous Heritage Roads to scenic Olde Towne Orchard where you will learn about the apple varieties grown there and hand-pick some of these juicy crisp gems. Back at The Table, you will join our Chef in the kitchen to create preserves, savoury dishes and sweet treats while sipping local cider. Definitely the way to get your ‘Apple a Day’! What is nicer than the smell of fresh bread? Have you always wanted to know how to make homemade bread but haven’t had any success or been afraid to try it on your own? In this class, we will teach you the basics of breadmaking as you make your very own loaf of braided artisan bread from start to finish, and offer tips to help make breadmaking at home stress-free. Once you unlock the secret of artisan bread, you will be able to make a batch of dough at home that will last you through the week and allow you to make fresh bread every night for your family. You knead to try this one! Using herbs and edible flowers to make food extraordinary! Herbs and edible flowers are flavourful delights that make food amazing and can be grown almost anywhere! In this class you will learn to identify a variety of herbs and flowers – many grown right in The Table’s garden – taste them and learn how they enhance our food and keep us healthy. We will teach you the best way to preserve herbs, then create incredible syrups, oils, butters and sauces which you will enjoy with your beautiful meal, finishing with a flower-infused dessert and an opportunity to take home a sample of one of the creations of the day. You will never want to be without these ‘secret flavour weapons’ again! Have you ever wanted to learn how to perfectly sear a scallop, debeard a mussel, or unravel the mystery of getting the succulent meat out of a lobster? Do you wonder how these briny gems live and grow to be the food of our dreams? The waters around Prince Edward Island offer a bounty of fresh seafood that is farmed and fished by local fishermen and women. 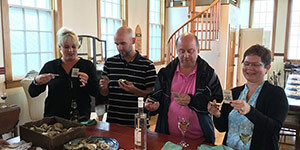 Located only minutes from New London Bay, The Table sources the freshest locally-caught lobster and shellfish for you to create an elegant and flavourful meal while learning about the different fisheries on the Island and the best cooking techniques to bring the treasures of the sea to your table. You’ve never tasted the sea like this! Experience Island farming the organic way! Farmers and fishermen are the heart and soul of the history and lifeblood of Prince Edward Island. With almost 50 organic producers and approximately 10,000 acres of certified organic farmland on the Island, the PEI Certified Organic Producers Cooperative aims to make farming PEI’s famous red soil sustainable based on the principles of Health, Ecology, Fairness, and Rare. In this class we will visit a local organic farm, Alexander Fresh Vegetables, to meet one of these organic farmers and learn how the principles produce vegetables bursting with intense flavour and nutrition while preserving the soil for generations to come. Get ready to “Get Red” as you dig into the earth for a harvest of the freshest organic produce. Back at The Table, you will prepare a fresh and delicious feast – organically! A family farm and culinary adventure! On the farm everyone in the family helps with the chores. From big to small, young to old, each pair of hands pitches in to get the work done. In this class we join local farmer Nancy Sanderson at Hope River Farm for her morning chore rounds, helping to feed the chickens, sheep and pigs and collecting the eggs from the hen house. We will then head to The Table to create a tasty three-course meal of recipes suitable for aspiring young Chefs using the eggs that you gathered at the farm. This is a true family experience for kids and their parents to get some hands-on fun and learning at the farm and in the kitchen. Lend a helping hand, be a farmer for a day! Did you know one of every three bites of food we eat is a result of pollinators like honey bees? That's just how important bees are to the cycle of foods we feed our families. In this class, we will visit local Beekeeper and Environmentalist, Sharon Labchuk in Stanley Bridge for a tour of her bee hives. She will teach us about the vital role bees play in Island agriculture, what beekeeping is all about and how honey is harvested. We will then take our fresh honey knowledge back to The Table where you will work with our Chef to create unique and tasty dishes and treats that will tantalize your taste buds. You have to taste it to bee-lieve it! In this class we immerse ourselves in the culinary world of Marilla Cuthbert from the beloved Anne of Green Gables novels written by author Lucy Maude Montgomery. What types of foods would Marilla have made for Anne and Matthew? Using the Anne novels and L.M. Montgomery’s own cookbook as inspiration we delve into Island history and create a delicious meal of traditional PEI recipes worthy of Marilla’s table. 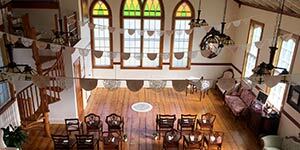 During lunch we will be joined by local Montgomery historian Denise Bruce of Montgomery Inn at Ingleside who will regale us with stories of Ms. Montgomery and tales of life on the Island in the early 1900s. Anyone for some raspberry cordial? Unraveling the Mysteries of Mead. What is Mead? Mead is a wine made by fermenting honey. It is the oldest fermented beverage known to man, with a history dating back to the Stone Age and roots in the mythology and customs of the peoples of Europe, Africa and Asia. Unique to the terroir and flowers that the honey bees forage on, the flavour of mead changes from year to year, and is also created by using local fruits, flowers and herbs during the fermenting process. In this experience, we visit Charles and Laura Lipnicki at The Island Honey Wine Company to see how they make their award-winning Island meads, meet the hard-working bees, tour the certified organic fields and the fermenting room, and enjoy a private wine tasting. In the kitchen at The Table, you will create a three-course meal with our Chef using mead and local honey. You won’t want to miss a sip of this class! The shucking truth about oysters! Oysters grown and harvested in the waters of Prince Edward Island are among the finest you will ever taste. In this class, we will join local Island aquaculturalist George Dowdle of Green Gables Oysters who will teach us all about oyster and quahog farming. Experience a “day in the life” of an aquaculturalist by visiting George’s oyster farm to see some of the daily tasks of farming oysters and quahogs. 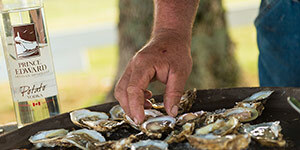 Taste oysters taken straight from the water and learn how to shuck your very own oysters and quahogs. Back at The Table, you will discover some simple techniques to showcase and enjoy these briny gems at their best, and create a delicious meal. This is a true shore-to-table experience you won't want to miss! Preserving the abundance of the Fall Harvest! Fall is approaching - the gardens and orchards are producing more perfectly-ripe food than we can possibly eat, and the age-old question arises – what can we do to keep all of this bounty for leaner times? In this class you will learn all about safe preservation processes: canning, pickling, fermenting, culturing, dehydrating, freezing and which best suits the item you are trying to preserve. We will use some of these techniques to preserve fresh local fruit and produce, and you will take home something pickled, something being fermented, something to freeze and the knowledge of how to enjoy the sunshine-ripe abundance of Summer through the long days of winter ahead. Enjoy the harvest and preserve it too! First introduced in 1758 from Britain, potatoes have grown from being a crop that allowed settlers to survive, to a billion-dollar plus industry that employs 12% of the province’s workforce, is the second-largest exporter of seed potatoes in the world, and harvests over 2.8 billion pounds of potatoes annually. That’s a LOT of potatoes! PEI’s growing conditions and climate are perfect for potatoes. In this class we will visit a local farm to learn about the history of potato farming on PEI and see how they are grown and harvested today. In the kitchen at The Table, you will learn creative ways to prepare Canada’s favourite comfort-food root vegetable. We’ve never met a potato we didn’t love, have you?